Wonder Woman — who, me? Confession: I loved the “Wonder Woman” television show back in the 70s. Lynda Carter was smart as well as beautiful, had a career, a fabulous costume (though unattainable for someone of my, er, stature) and she kicked the guys’ butts all the time. It saddens me to this day to see her or Bionic Woman Lindsay Wanger hocking stuff on infomercials. Why, why, why? I can be cheered today, though, that my secret pre-teen fantasy has come true. 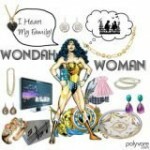 Finally, thanks to Elizabeth at parentingpink.com, I get to be Wonder Woman! Elizabeth, by the way, is one of my blogging heroes. She tackles bullies with a single hand and isn’t afraid to admit that traumatic holiday photo shoots make her hit the merlot. Plus she’s a shrink, too — she can read your mind, you know. She’s not afraid to laugh at herself and her misadventures raising three girls, and we all could use a lot more of that trait in this day and age. It’s up to me now to bestow super powers to two more bloggers, and I’m picking a long-time friend and a new cyber friend. Genevieve at motherofconfusion.com is a former co-worker who taught me everything I know about blogging. She probably wouldn’t have if she’d realized what a monster she was unleashing. Nah, Genevieve would have anyway, because that’s the kind of person she is. She works full-time, has a teen and a toddler and a baby girl due in April. She’s also active in autism and special needs issues, often blogging about those topics. Cheryl at The Daily Blonde is one of the many wonderful people Twitter has brought into my life. Her blog is a daily dose of humor, but with serious thought behind it. And her tweets keep me laughing through out the day and night. Oh, and she juggles five kids and a writing career. Right now, she’s doing it on crutches, which by definition makes it hard to juggle when you have no hands free. She manages, though, and with her usual aplomb. Awwwww! Your sweet sentiments brought tears to my eyes. They are falling into my Merlot right now!